Bridge is much more than a card game. It is a game of skill in which, using “Bidding” to communicate, each team tries to find the contract that will yield the most points. The game of bridge requires 4 players, symbolized by the 4 cardinal directions (North, East, South, and West). The 2 players facing one another are teamed up against the 2 others. A player takes a standard deck of 52 cards, shuffles and deals them in clockwise rotation. The aim of the game is to take the most tricks in a contract that can be played notrump (NT) or in a particular suit (♠, ♥, ♦, ♣). The point of bidding is to determine the denomination (in a suit or notrump) and the level (number of tricks) of the contract. The dealer bids first. If his or her hand is strong enough, he or she makes a bid, or otherwise passes. Then comes the turn of the person to his or her left, and so on and so forth, always in clockwise rotation, until a final contract is settled upon. The contract is set when the next three players pass after a bid. The team playing the contract must at a minimum take the number of tricks it has committed itself to win. The opposing team tries to defeat the contract. The person playing the contract is the declarer, i.e. the player who first bid the denomination of the final bid. The player to the left of the declarer plays his or her first card: the opening lead. The declarer’s partner places his hand face up on the table, for all to see, and becomes the dummy. The dummy takes no initiative; he or she plays his or her cards according to the declarer’s instructions. He or she cannot suggest any lead or play, nor express his or her discontent if his or her partner does not seem to be playing the right card. If more than one player trumps in, the highest trump card wins. You succeeded in fulfilling your contract: you score points! The number of points scored depends on the level of the final bid and the number of tricks earned. Unfortunately, if you do not succeed in fulfilling the contracted number of tricks, your opponent will be scoring points instead. 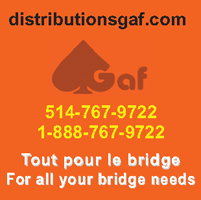 In tournaments, the game of bridge is not based on luck. The score of teams sitting at different tables but playing the same hand are compared. Compiling the results determines the teams that did best. Therefore, to win one must implement genuine strategies and make the best decisions at the right moment.